The Super Eagles technical adviser, Genort Rohr could miss the services of Leon Balogun for the 2018 FIFA World Cup qualifier against Zambia on October 9 due to injury. Balogun, who has formed a formidable partnership with William Troost-Ekong in Nigeria’s 1-0 win over Tanzania in a 2017 Africa Cup of Nations qualifier, was injured in the early part of the encounter as FSV Mainz lost 2-3 at home to Bayer Leverkusen on Saturday in the Bundesliga. Having featured four times for the senior national team since making his debut on March 2014 against Mexico in an international friendly, the former Darmstadt 98 defender could be sorely missed by the Super Eagles technical adviser, Genort Rohr. In a related tweet by his club after the match, they never specified the nature of his injury and when he’ll return for league action. “An early substitution for the #Zerofivers as the injured @LeonBalogun is replaced by Alexander #Hack! (9′) #M05B04 0-0. 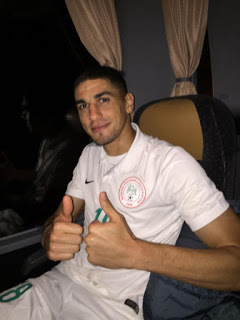 “Hopefully that earlier injury to @LeonBalogun is nothing serious! (15′) #M05B04 0-0,” @Mainz05en tweeted.